Beveled flat pencils used by construction companies and those in the building trades. Flat design keeps the pencil from rolling or blowing away. Red and black finish with black lead; 7" long; PMA certified non-toxic. Long lasting pencils used by construction companies and those in the building trades. The flat design keeps the pencil from rolling or blowing away, while the double-sided lead is handy for marking measurements or taking notes; 7" overall length. Non-abrasive, non-conductive marker for all glazed and slick surfaces. Wipes clean with damp cloth. Paper wrapped with string for easy sharpening. PMA certified non-toxic. Long lasting pencils used by construction companies and those in the building trades. The flat design keeps the pencil from rolling or blowing away, while the double-sided lead is handy for marking measurements or taking notes; 7" overall length. Long lasting pencils used by construction companies and those in the building trades. The flat design keeps the pencil from rolling or blowing away, while the double-sided lead is handy for marking measurements or taking notes; 7" overall length. Clog resistant marker tip; writes through dusty, wet and oily surfaces; durable marker tip for writing on concrete, OSB, and rough surfaces; built-in hard hat storage clip; fine point; ink dries in seconds; lanyard hole; anti-roll body design; non-toxic ink. Ideal for writing on china, glass, metal or plastic. Marks on porous or non-porous surfaces. Fade and moisture resistant. Write length of 2500 ft. Ideal for writing on china, glass, metal or plastic. Marks on porous or non-porous surfaces. Fade and moisture resistant. Write length of 2500 ft. Ideal for writing on china, glass, metal or plastic. Marks on porous or non-porous surfaces. Fade and moisture resistant. Write length of 2500 ft. Double ended marking tool with pencil and crayon. On-the-job color coding of utility service locations used to mark building supplies, concrete forms, and more; fits any nail or tool pouch. Double ended marking tool with pencil and crayon. On-the-job color coding of utility service locations used to mark building supplies, concrete forms, and more; fits any nail or tool pouch. Double ended marking tool with pencil and crayon. On-the-job color coding of utility service locations used to mark building supplies, concrete forms, and more; fits any nail or tool pouch. Double ended marking tool with pencil and crayon. On-the-job color coding of utility service locations used to mark building supplies, concrete forms, and more; fits any nail or tool pouch. Dixon Marker, Heavy Duty, Leak-Proof, Series: RediMark, Green, Chisel Tip, Composition: Xylene, Solid, Slight Solvent Odor, 27 deg C Flash Point, 0.91 Specific Gravity, Applicable Materials: Glass, Plastic, Metals, Wood, Cellophane and Paper, Resists: Fade, OSHA 29 CFR 1910.1200, 6 in Length, For Tough Environments Heavy duty metal barrel; chisel felt-tip with anchored nib construction; fast drying, permanent ink. Dixon Marker, Heavy Duty, Leak-Proof, Series: RediMark, Blue, Chisel Tip, Composition: Xylene, Solid, Slight Solvent Odor, 27 deg C Flash Point, 0.91 Specific Gravity, Applicable Materials: Glass, Plastic, Metals, Wood, Cellophane and Paper, Resists: Fade, OSHA 29 CFR 1910.1200, 6 in Length, For Tough Environments Heavy duty metal barrel; chisel felt-tip with anchored nib construction; fast drying, permanent ink. Clog resistant marker tip; writes through dusty, wet and oily surfaces; durable marker tip for writing on concrete, OSB, and rough surfaces; built-in hard hat storage clip; fine point; ink dries in seconds; lanyard hole; anti-roll body design; non-toxic ink. 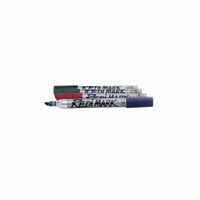 Clog resistant marker tip; writes through dusty, wet and oily surfaces; durable marker tip for writing on concrete, OSB, and rough surfaces; built-in hard hat storage clip; fine point; ink dries in seconds; lanyard hole; anti-roll body design; non-toxic ink. Writes on all glazed and slick surfaces; Red, Blue, and Yellow. Carpenter Pencil never needs sharpening! Each packaged contains 2 pencils with 8 tips and an additional 16 bonus cartridges. Clog resistant marker tip; writes through dusty, wet and oily surfaces; durable marker tip for writing on concrete, OSB, and rough surfaces; built-in hard hat storage clip; fine point; ink dries in seconds; lanyard hole; anti-roll body design; non-toxic ink. Oval shape increases stability on flat surfaces; contains ink that is permanent on most hard-to-mark surfaces; rubberized barrel & cap design make the cap easy to remove even when wearing gloves; ideal for wet, oily and abrasive surfaces such as sandpaper, concrete, brick, glass, metal, plastic, wood, sporting equipment, and more. Integrated emory board for fine point filing. Narrow sharpening angle for broader, more durable point reduced lead breaking. Uses 50 percent less pencil per sharpening cycle and has 20 percent harder blade for longer life.